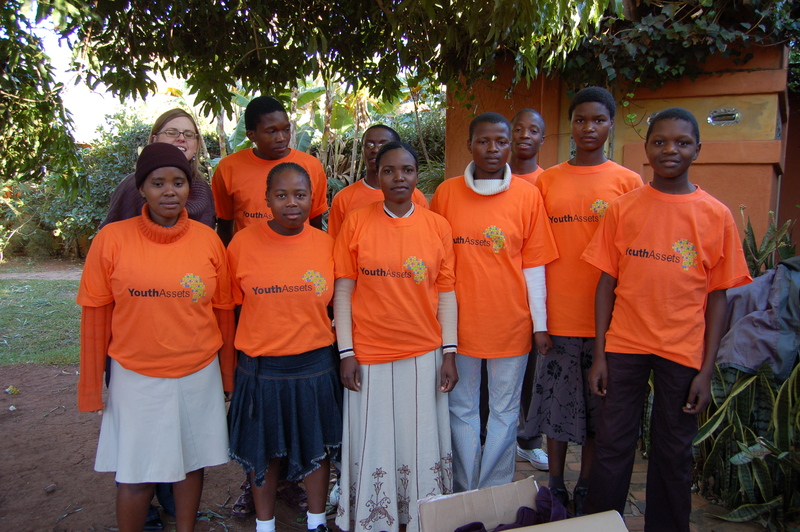 One of YouthAssets’ most innovative initiatives is the Youth Advisory Board, comprised of a group of ten Swazi youth who provide critical insight and suggestions for developing long-term solutions to current challenges faced by youth-headed households in rural areas. Heads of households themselves, these youth have dealt with these daily challenges such as obtaining enough food for their siblings “without relying on handouts” or attending school while also running a household. The Youth Advisory Board (YAB) members’ ages range from 13 to 24. Eight of the ten youth attend school, and each youth has a cell phone. Using these cell phones, the youth regularly participate in conference calls with YouthAssets. The calls are directed by Jennifer Sly, the Founder and President of YouthAssets, who leads the discussion on crucial issues concerning the YAB members including their daily activities, frequent challenges they face and visions for the future. The Board members are compensated for their advisory services with money, which is usually transferred via SMS, as well as other means of support such as school fees and eyeglasses. The meetings begin on a personal note as each participant shares stories about the week and voices thoughts on other participants’ experiences and challenges. Then the call heads straight into business, where discussions focus around the “theme” of that particular call. Topics vary from agricultural innovation to philosophical understanding. The latest theme was based around Amartya Sens’ “Freedom as Development”, which led to discussions about freedom of speech and freedom of religion, concepts that are not usually spoken about in Swaziland. Many positives have come from the calls. Within one week after the first conference call, the youth called Jennifer and expressed interest in attending the funeral of a fellow Board member’s aunt. In addition to gathering the funds to make travel arrangements, the youth also organized a YouthAssets choir to sing at the funeral. Also demonstrating the positive impact of these phone calls was the development of a communications strategy called “buzzing”, where one member calls other members, lets it ring once and hangs up. This allows the member to let another member know that he or she is there and is okay. The receiver of the “buzz” then buzzes the next member in line, and the buzzing continues until it comes full circle and reaches the initiator of the buzz. This communication is completely free and was developed by the youth only days after the first phone meeting. One recurring point that has come from these discussions is the desire to be self-sufficient. Short-term goals associated with this long-term desire include finishing school and/or starting a business. Business ideas have been diverse: laundry service, baking and babysitting among others. The youth continually express their excitement for the weekly engagement, how much this network of peers has helped them emotionally and how it has empowered them to stay motivated in their quest for a more sustainable way of life. Mobile technology has truly allowed these youth to engage each other, serve as a support network for each other and provide valuable insights to YouthAssets to develop long-term solutions to everyday challenges. Engage. Empower. Engage to empower.